Summary: It’s a pleasure, too, to see a film about friendship between women, even if their friendship is ultimately destroyed by male rivalry. The Edge Of Love surprised me. I cordially dislike Keira Knightley and have never really seen Sienna Miller act (her performance in Casanova notwithstanding: though she was charming on stage in As You Like It, Helen McCrory was the star of that show). 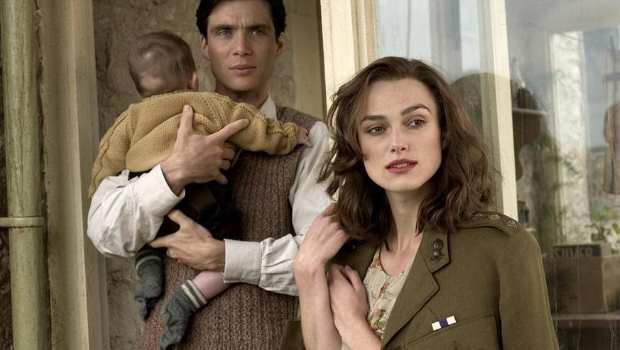 But here they, though playing totally to type, are also totally convincing as the women in Dylan Thomas’ (Rhys) life, his wife Caitlin (Miller) and his childhood sweetheart Vera (Knightley) who form a dysfunctional family during and following the Second World War. We open on an extreme close up of Knightley’s face, glossily lipsticked and marcel waved, apparently singing show tunes on a Hawaiian beach, before pulling back to reveal that she is in face singing in the tube to keep bombed out Londoners’ spirits high. Vera is Welsh, beautiful, and fiercely independent, earning her own money and determined to rely on no-one; nevertheless she is delighted when she runs into her old friend and lover Dylan in a pub. Now reluctantly writing propaganda for the War Office, Dylan is equally pleased to see her, and they arrange to meet again, though Vera is taken aback when Dylan introduces her to his wife, bohemian and comely Irish lass Caitlin, whose party trick is turning cartwheels while wearing no knickers. Despite their potential rivalry, the two women become friends; Caitlin takes her own lovers and allows Dylan to do the same, but asks Vera not to betray her. Vera meets and eventually marries her devoted admirer, the handsome officer William Killkick (Murphy), but when he is posted abroad and the friends move to Wales to save money, holing up in two thin-walled asbestos cottages with their children and causing scandal in the village with their London ways, Vera struggles to deny her feelings. William returns from the war suffering from shell shock and struggles to come to terms with domestic life and the wellie-wearing, windswept wife who has replaced the glamorous chorus girl he married. Drinking to calm his nerves, and furious because Dylan and Caitlin have been living on his pay, William’s anger is further inflamed by neighbourhood gossip and one night he attacks the Thomas’s cottage, forcing Vera to choose between her husband and her friend. Filmed on location in Wales and war torn London, the film has also garnered lots of attention for the clothes, with tea dresses, Fair Isle cardies, trilby hats and Wellingtons forming the basis of many a fashion editorial. And Keira sings!